per square foot. Pressure filters (fig. 9-17) have the filter bed enclosed in a pressure vessel. 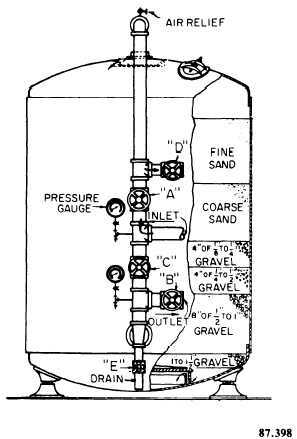 Water is either pumped into the vessel and forced through the filter or is drawn into the vessel and through the filter by a pump. The diatomite filter is classified as a pressure filter. Besides coagulation, sedimentation, and filtration, water must undergo an additional treatment step; disinfection. This is necessary because no combination of the other three steps can be relied upon to remove all disease-producing organisms from water; also because there is danger of recontamination during handling before consumption. Residual disinfection using chlorination is the final step in all water treatment processes (including distillation). Under emergency or field conditions, water may be disinfected with iodine or by boiling. Figure 9-17. - Pressure filter. factors. These include the chemical used, the contact time, the type and concentration of microorganisms, the pH and temperature of the water, the presence of interfering substances, and the degree of protection afforded organisms from the disinfecting solution by materials in which they are imbedded. Therefore, various concentrations of disinfectant are required depending upon the local environmental conditions and the amount of particle removal effected. Chlorine is the most commonly used chemical for disinfection of water. It is used in field water supply in the form of calcium hypochlorite, a standard item in the supply system (commercially known as HTH powder). When the calcium hypochlorite is dissolved, the chlorine goes into solution and a calcium carbonate sludge settles out. The chlorine is present in the solution as hypochlorous acid or hypochlorite ion (depending on the pH). Both forms are powerful oxidizing substances. The chlorine available in either form rapidly oxidizes the organic and inorganic matter, including the bacteria in the water. In this reaction the chlorine is converted to chloride and is no longer available as a disinfectant. The organic matter as well as such material as iron and manganese consumes the chlorine. The use of chlorine makes it possible to introduce an accurately measured dosage to ensure the destruction of disease-producing organisms and provide a readily measured residual to safeguard against recontamination during further handling. Chlorine dosage is the amount of chlorine added to water to satisfy the chlorine demand as well as to provide a residual after a specified time. The amount required to disinfect water varies with the organic content and pH value of the water, the temperature, the time of contact, and the chlorine residual required. The dosage is usually stated in terms of parts per million (ppm) or milligrams per liter (mg/l). The chlorine demand of water is the difference between the quantity of chlorine applied in water treatment and the total available residual chlorine present at the end of a specified contact period. The chlorine demand is dependent upon the nature and the quantity of chlorine-consuming agents present and the pH value and temperature of the water. (High pH and low temperatures retard disinfection by chlorination.) For comparative purposes, it is imperative that all test conditions be stated. The smallest amount of residual chlorine considered to be significant is 0.1 ppm. The relationship of the demand to the length of the contact period is discussed below.